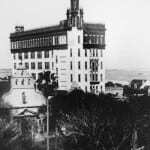 The Treasury on the Plaza is located in St. Augustine’s first and only skyscraper. The six-story building and its mezzanine went under construction in 1926, the same year as the opening of St. Augustine’s famed Bridge of Lions. 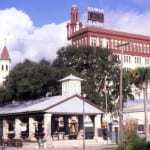 The building held the premier bank in St. Augustine’s downtown historic district up until it was converted to a private event venue in 2014. 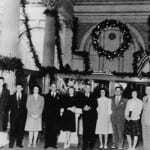 It has been known by many names over the years, including The First National Bank of St. Augustine, The Exchange Bank, The Espinoza-Sanchez Building, and The Atlantic Bank Building. 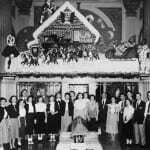 Throughout its history, the building has served as a space for art and cultural exhibits, historical shows, community gatherings, and as a symbol of prosperity for the city. 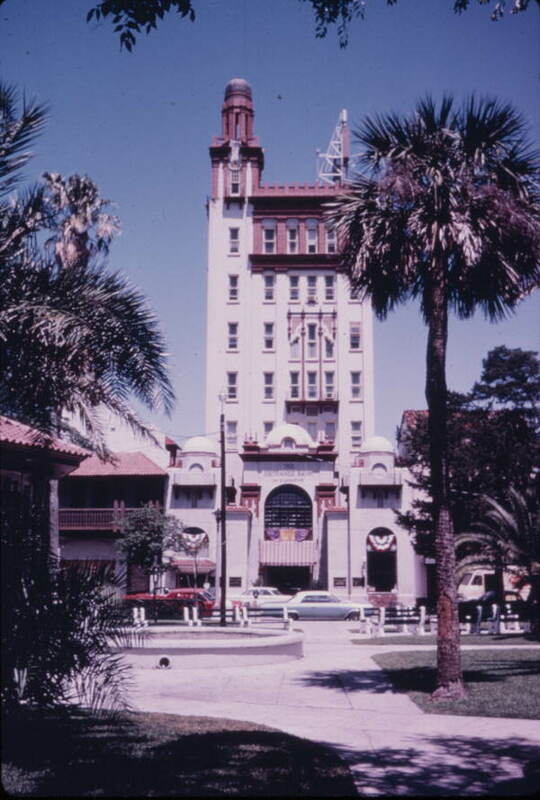 The building is listed on The National Register of Historic Places in honor of both its architectural and historical significance to Northeast Florida. 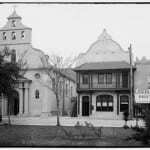 Cathedral Place in the early 1900’s was a much quieter street. 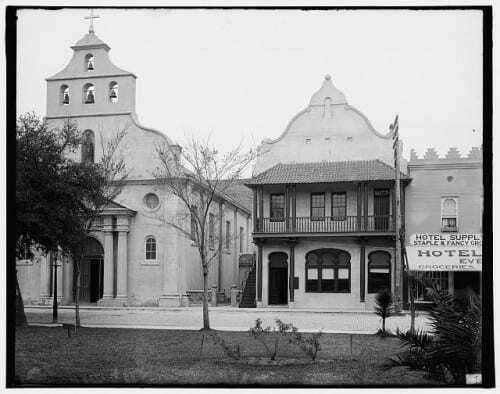 The Cathedral Basilica stands on the left with the original First National Bank Building on the right. October 2, 1926. 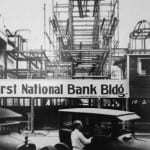 The new First National Bank Building is under construction. Framing for the top of the tower sits on top of the building to the right. The building stands tall in 1927. The view across the water to Vilano and Davis Shores shows an empty landscape. 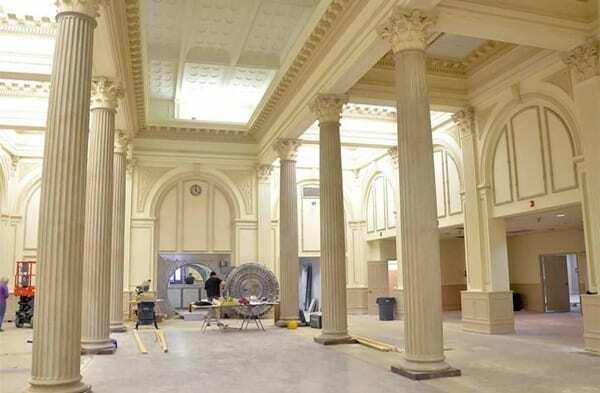 The historic First National Bank lobby was a sight to behold. Fresh flowers were delivered weekly to adorn the lobby. 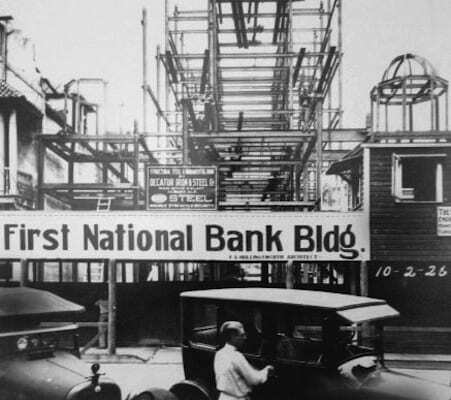 The First National Bank became The Exchange Bank in 1939. 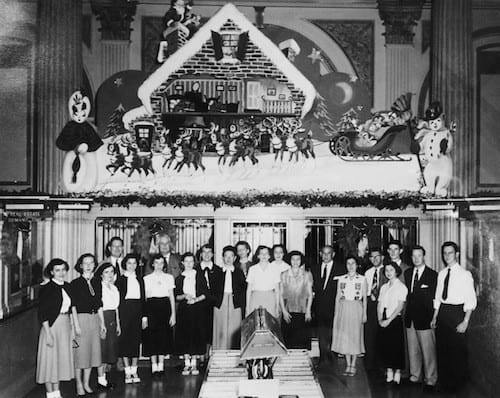 This photo depicts staff in front of the vault during Christmastime in 1941. 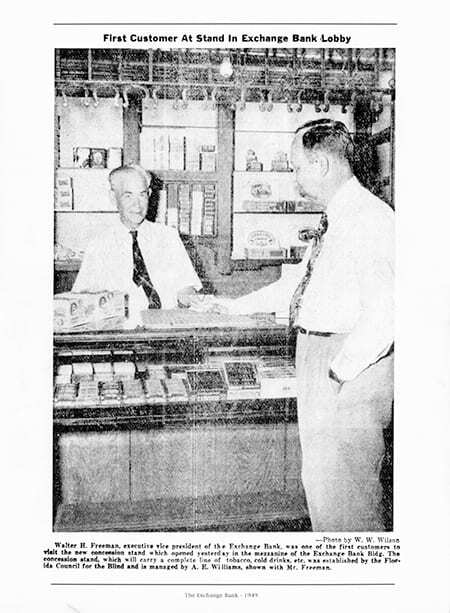 In 1949 a concession stand opened in the lobby of the Exchange Bank that served tobacco, cold drinks, and other wares. This area now houses The Grande Foyer Concierge Desk. 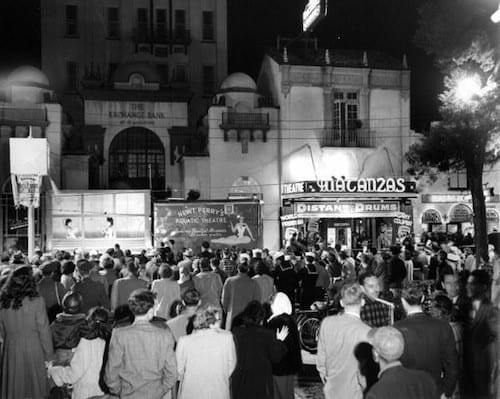 The Matanzas Theater opened in the late 1930’s next to The Exchange Bank building. 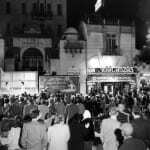 Movie premieres drew large crowds to The Plaza. 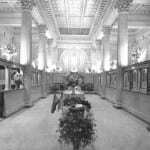 Over the years Christmas decor became more elaborate inside the bank, reflective of the prosperity of the time. 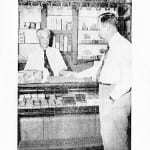 The 1960’s began a new area of development in St. Augustine, especially in the beach areas. 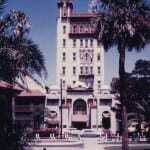 In the 1960s a digital clock was installed atop the bank building. For many years locals relied on the time and temp clock to keep them informed. 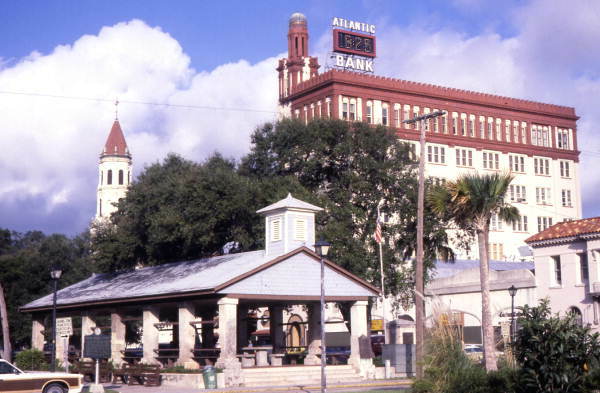 This photo shows the clock in 1979 at the top of what was then the “Atlantic Bank of St. Augustine.” The clock has since been removed. Wells Fargo bank occupied The Treasury building until 2013, when it moved across the Plaza de la Constitucion into the old Woolworth building. 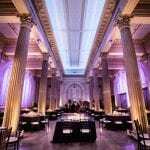 The entire first floor underwent an extensive renovation in 2014 to transform the space into an event venue. 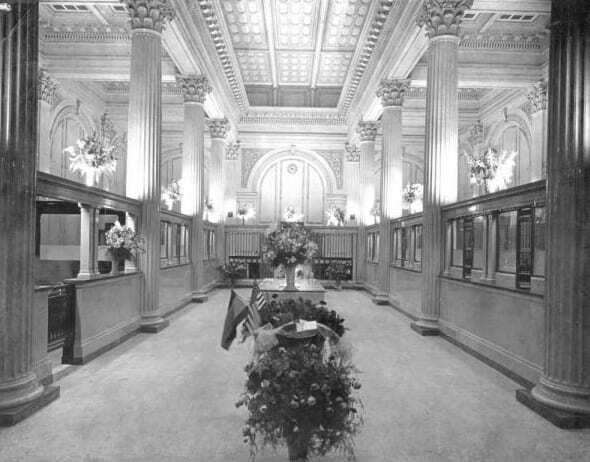 While many modern amenities were added, showcasing the venue’s history as a bank was of utmost importance. 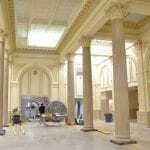 The motto of the renovation was, “If it’s historic, we’re keeping it.” The original 1920s marble flooring, the eight towering Romanesque columns, architectural details, and other materials were kept to create authenticity. 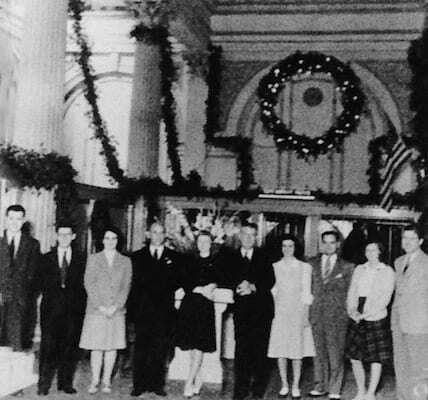 On May 3rd, 2014 The Treasury on the Plaza officially opened its doors for the first wedding in The Grande Ballroom. 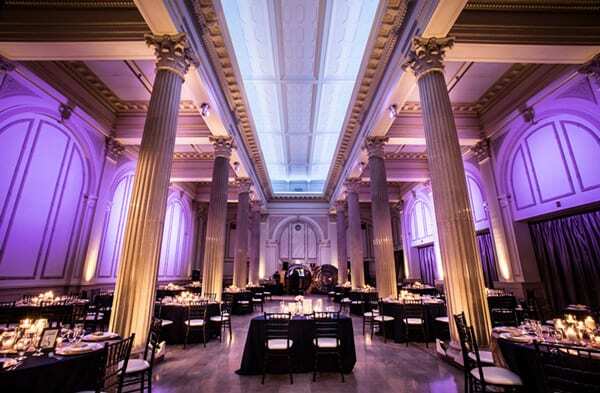 Since that time, our goal has been to provide extraordinary service to the couples and families who have chosen to celebrate their special moments at The Treasury. 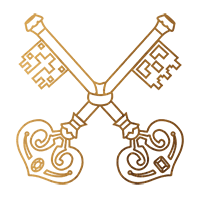 We feel truly honored to be a part of St. Augustine’s history and stewards of this incredible building. We hope that you’ll consider us to be a part of your own history.